We just returned from an amazing Bible Conference that challenged our walk with Christ, stretched our thinking, refueled our spirit, encouraged us in the Lord as well as educating us regarding the perilous times we are living in! While there, we learned of a group that had rallied together and went to DC to encourage and pray for those in office! This was birthed from one man’s passion for this great country to return to the Biblical principles this country was founded on! 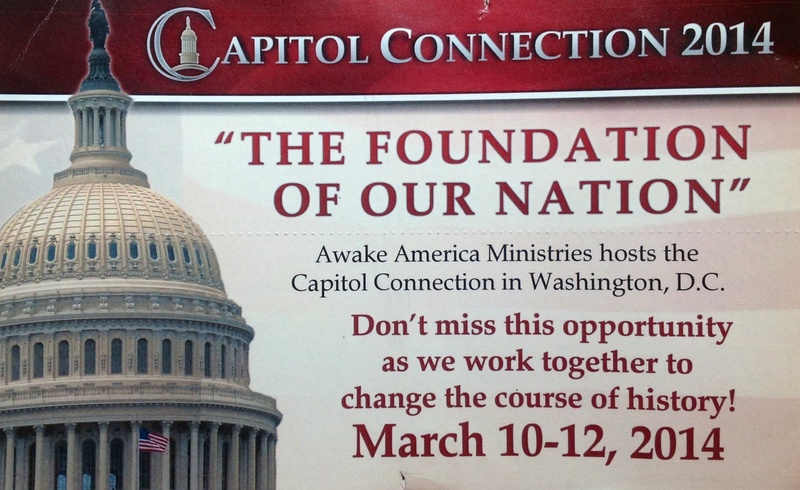 Earlier this spring, was the first ever “Capitol Connection” on Capitol Hill. There were 175 pastors who went representing 47 states, plus other families and church members of the United States of America, who went to the capitol and prayed with individual staff members, passed out over 3,000 Bibles and 20,000 gospel tracts. They were overwhelmed at the response they received, yet not surprised, because they KNEW that God went before them, paving the way. Dr. Chuck Harding said each staff member openly welcomed them into their offices. He explained to them how they were not there to ask anything of them, but to ask “how they could specifically pray for them.” Some were moved to tears, some in awe & asking them to set and stay longer, while others were asking these pastors for counsel and advice on upcoming bills that were coming to the table. These pastors prayed with them, read the scriptures, and passed out tracts! This “connection” resulted in an office that was donated to Missionary Evangelist, Dr.Chuck Harding directly across the street from the Supreme Court! GOD OPENED THOSE DOORS . . . doors that ONLY HE could open. One representative that had been in DC for 10 years said, “No pastor had ever come to see him”. Dr. Harding said that the most requested prayer request was, “would you pray for my family?” The staff members at Capitol Hill were humbled and awed, and it was because men of God chose to be the hands and feet of our Savior while doing what Christ has called us to do. In 2014 they are hoping to have over 500 pastors and any families that want to go and take part in changing the course of history of this country! This does not mean that the wrath of God is not coming on this country, but we can change what we can, while we are here!